The Sawyers View-Master Model E (#2015) was produced between 1955 and 1961 and was the replacement for the Model C. It was made from bakelite. This viewer is very easy to find and was made by Sawyers in the USA, Belgium, France, India and Australia. Sawyers also manufactured a light attachment (#2051) for this model of viewer. It ran from two 'D' size batteries and worked very well although it was withdrawn from sale a year before the viewer went out of production. Model E Viewers were made in several countries, including India, Belgium, France, Spain, Australia and the USA. The pictures below show the markings from a couple of uncommon models, made in France and Australia. 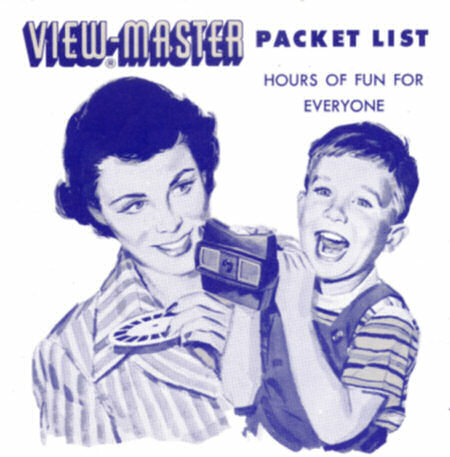 The French viewer was only made for a short time in 1957. The Spanish Model E was once thought of as rare, but in recent years many have been discovered, although they are still quite difficult to find. It's construction is greatly inferior to the USA manufactured version of the black Model E. The two halves of the viewer body do not meet as precisely and the viewer is considerably lighter than it's American cousin. Even the red advance lever is of lower quality The seam line down the side of the lens is more pronounced and astonishingly, the View-Master logo is upside down!. Look for the word VISOR on the box. 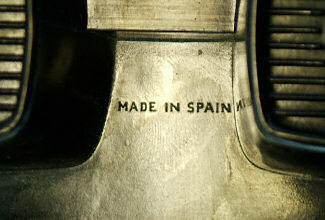 Made in Spain is located between the eye pieces and the logo is upside down! 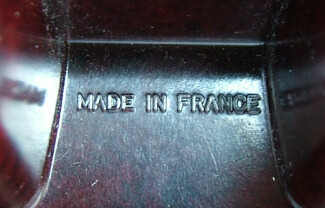 The country of manufacturer mark and French Model E box. 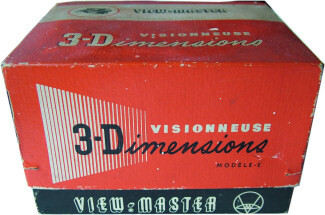 Notice the word Visionneuse on the box, (French for 'viewer'). The French made Model E is worth approximately eight times the value of the standard brown USA manufactured viewer and the Australian version about seven times it's value. 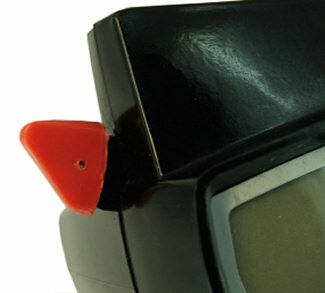 The black Model E viewers were only manufactured in Portland Oregon and had either a red or ivory advance lever, with red being the more common colour. 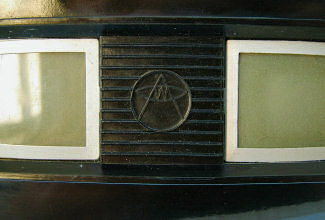 There are a number of colour variations in existence for Model E viewers. These variations were made in Belgium and not sold in the United States. The non-standard colours were maroon, cream, grey, blue (with a red advance lever) and red (with a yellow advance lever). This viewer cost 19/11 in UK pre-decimal money (a penny less than a £). A pin (or badge) dating to approx. 1957. 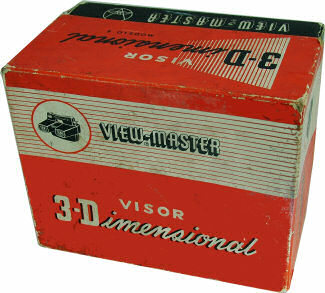 Originally thought to have been given to dealers, it has since come to light that these were given away for promotional purposes to advertise the arrival of the Model E viewer in 1955 when it was first launched.